If something seems too good to be true, it probably is. Different fad diets come along every day promising the easy path to quick weight loss. However, any diet that claims to hold the secret to radical weight loss is likely to be more detrimental to your health and long-term diet goals than it is beneficial. No matter what the latest diet craze is promoting, it is a simple fact that eating a balanced diet that includes moderate portions of healthy foods, combined with regular exercise, is the only proven way to achieve long-term weight loss. One of the fad diets that has been adopted by many people is the three day-diet. This is a food rotation diet that involves eating only a particular food group for three days at a time. For example, a follower of the three-day diet would eat nothing but fruit for three days. A different type of food would be consumed exclusively for the next three days, and so on. While fruit is a healthy food, it should be consumed as part of a balanced diet, and not eaten exclusively for a set period of time. Other restrictive diets include those that restrict carbohydrate consumption. The most widely recognized carbohydrate controlled diet plan is the Atkins diet. This diet recommends significantly decreased carbohydrate consumption, but places no limits on protein or fat consumption. Protein and fat are healthy foods that are required for proper body functioning. However, excessive protein and fat consumption is not healthy. Additionally, carbohydrates are an essential component of any healthy eating plan. The human body needs carbohydrates for energy. This plan can lead to rapid weight loss, but is not a healthful way of eating for long-term good health. At another extreme are diet plans that are extremely low in fat. It is a good idea to reduce fat consumption, but it is not healthy to eliminate fat from your diet. Some fat is necessary in the human diet. Additionally, many people following low-fat diet regimens think that they can eat unlimited quantities of fat-free foods. However, the fat-free formulations of many commercial foods actually contain increased sugar and salt, both of which can be used as fillers to replace the fat. 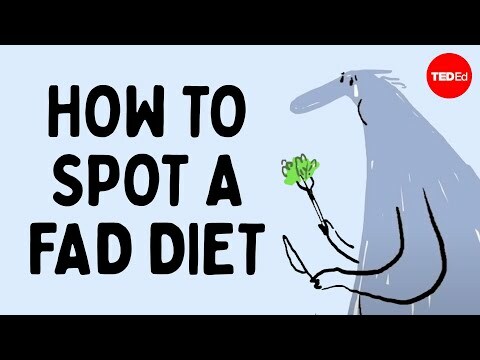 People who eat too much of these types of foods can find they actually gain weight while sticking to a low fat diet plan. Instead, follow the time-proven common sense diet plan. Eat less and exercise more. Follow a balanced diet that involves eating a moderate portion of healthy foods at regular intervals. Eat whole foods that represent all of the basic food groups every day, and follow a regular exercise program that is appropriate for your age and health. Bear in mind that any diet that claims that you can drop fifty pounds in one week falls in the category of something that is too good to be true. We as humans are all different. There is no 'one size that fits all' when it comes to diet.